My Son Pinocchio in Alexandria, LA! Check out this interview! Then go buy tickets! 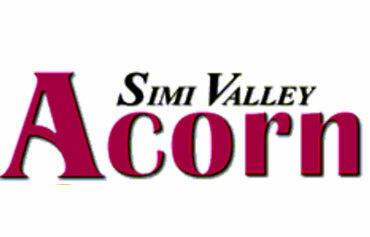 Break a Leg, Conejo Players! 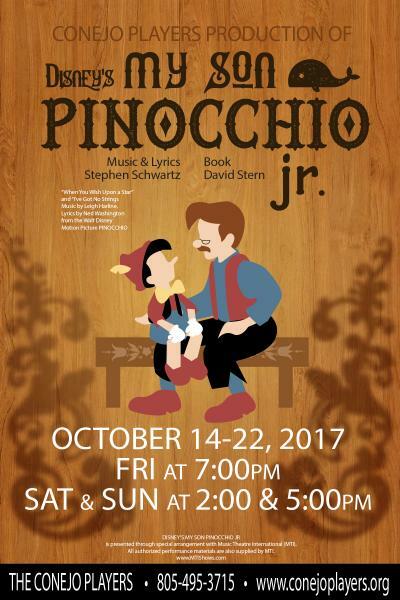 My Son Pinocchio Jr. opens tonight at The Conejo Players Theatre! Get your tickets now, and make sure to bring your entire family. Break a leg, folks! Allwayz On Stage’s Pinocchio a Hit! Allwayz On Stage delivered a heartwarming theater experience earlier this month when it presented its latest production at the Hillcrest Center for the Arts.The company, launched a year ago by Laurie Johnson and Tracy Costanzo, offers stage opportunities for young adults ages 16 and over with special needs. Johnson and Costanzo’s daughters, Breezy and Samantha (Sammy), who have been friends since kindergarten, regularly put on shows in their backyards. But with last year’s successful “Beauty and the Beast,” their personal fairy tales came true as they starred in the fully staged production, complete with sets, costumes, music and choreography. 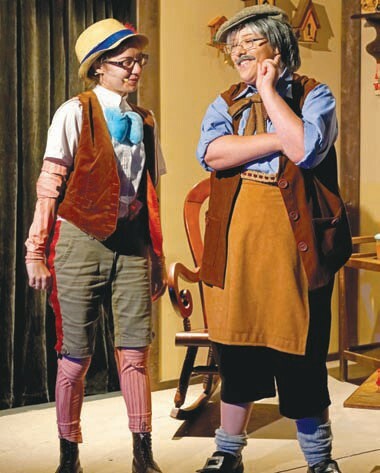 Now 25 and 24, respectively, the pals headlined the cast in the company’s second production, “My Son Pinocchio Jr.,” which had a three-day run ending on Aug. 13. 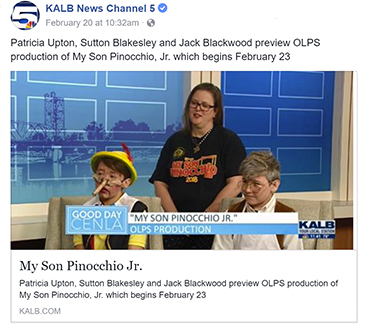 As they did last year, Johnson (director) and Costanzo (choreography) joined forces to stage the show, with their daughters playing the principal roles: Breezy as Geppetto and Sammy as Pinocchio. The production traces the familiar story from Geppetto’s perspective, beginning when Pinocchio becomes a real boy and taking us through flashbacks. To Geppetto’s dismay, Pinocchio engages in behavior not unlike that of real live boys: He’s incorrigible and uncooperative, leading Geppetto to call the Blue Fairy and ask for a refund on his wish, claiming Pinocchio is defective. The Blue Fairy (played by Abigail Arnal) is one of two characters from the fable whose roles are expanded. Stromboli, the bombastic carnival owner and puppeteer (played by one of the company’s many adult mentors, Ben Deschaine, who also built the set), is the other. The Blue Fairy heads up a school of fairies in training (Brooke Baldauf, Amanda Counts, Erin Schleich and Megan Tresback), boasting about her “perfect record” of successfully granting wishes. Allwayz On Stage also provides initial acting opportunities for younger performers, and the show featured debuts by Isla Burditt, Owen Sayles, and sisters Siena and Eden Judovits. The Allwayz On Stage mentors are professionals who’ve been working with the challenged actors since April. Onstage, many serve as guiding partners to make sure the special needs actors hit their marks and prompt them if they forget a line. The latter instances were few and far between, as everyone performed admirably and professionally, encouraged by the enthusiastic audience. Others included Emalee Burditt, Katie Gill, Chrys Ryan Johnson, Meghan Pool and Ryan Satterfield, who played Professore Buonragazzo, inventor of the “perfect child” machine, which produces “Body Snatcher”-like obedient children. Hmm. Not a bad idea. My Son Pinocchio Jr. in Thousand Oaks! 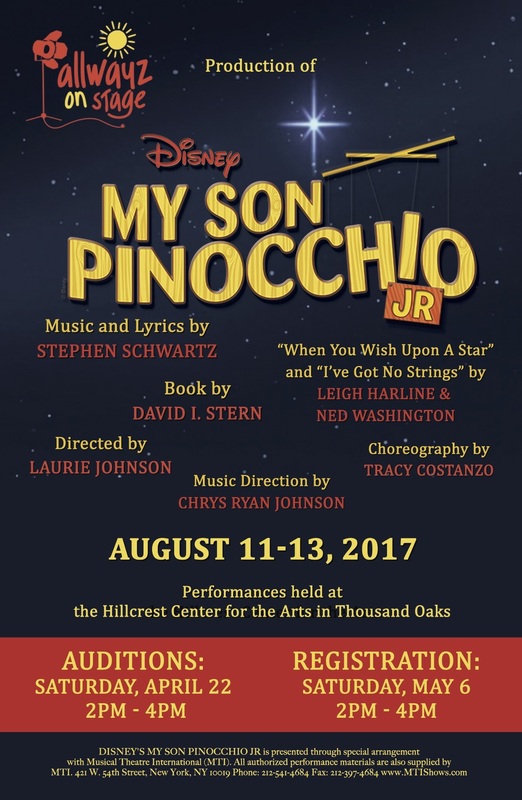 The Conejo Players are mounting a production of My Son Pinocchio Jr. from October 14 – 22, 2017. Make sure to buy your tickets soon! My Son Pinocchio at Allwayz on Stage!! Allwayz on Stage is a Theatre Company for Young Adults with disABILITIES. You do NOT want to miss this show.